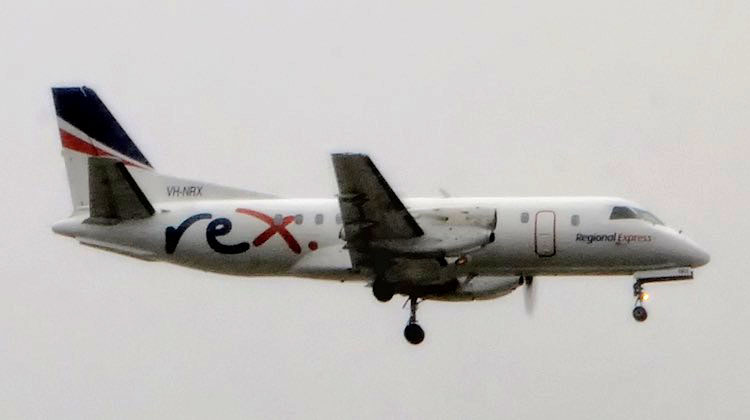 Regional Express (Rex) says it will immediately withdraw four aircraft with propeller gearboxes and shafts of the same series as that of its Saab 340B which lost a propeller during a flight to Sydney. The incident took place on Friday, when the propeller from the right hand engine of Saab 340B VH-NRX, which was operating flight ZL768 carrying 16 passengers and three crew en route from Albury to Sydney, separated from its shaft when the aircraft was about 20km from Sydney Airport. The pilots landed the aircraft safely with all on board unharmed. The Australian Transport Safety Bureau (ATSB) has opened an investigation into the incident and called on anyone who has found the missing propeller to contact either it or the police. Rex said on Monday it had decided “by abundance of caution, to immediately remove from service and quarantine all propeller gear boxes and shafts of the same series as that of the incident for further inspection and testing if warranted”. A spokesperson for the airline told Australian Aviation five of Rex’s 55 Saab 340 fleet would be taken out of service as part of the ongoing investigation. The figure included the aircraft involved in Friday’s incident, including VH-NRX. Of the five, two were operating with Rex’s Pel-Air subsidiary as freighters, while one was from Rex’s Sydney base and two from its Melbourne base. “There will be some minor disruptions for 1 or 2 days,” the spokesperson said in an emailed statement on Monday. The airline said it was for the ATSB to determine the root cause of the incident through its investigation and metallurgical analysis. “As there is an on-going investigation by the ATSB, Rex will leave it to this authority to provide any technical updates it deems appropriate,” Rex chief operating officer Neville Howell said in a statement. Rex also offered a few more details on what happened during the flight. It said the pilots shut down the right hand engine in accordance with checklist procedures after they noticed “abnormal indications”. “It was at this point that the propeller assembly was seen by the first officer to separate from its shaft,” Rex said. “The propeller assembly was seen to rotate upwards and to the right. The propeller was seen rotating in a horizontal position and then moving away without making contact with the aircraft. Rex said it had been in contact with the aircraft manufacturer Saab and the engine manufacturer General Electric (GE). “This is an extremely rare event and the only other recorded similar event was in 1991 when US carrier Comair’s aircraft also landed safely after a separation of its propeller,” Howell said. Howell also praised the captain and first officer for their handling of the incident. “The crew demonstrated enormous composure and discipline under extraordinary circumstances, and I commend their professionalism,” Howell said. “The captain displayed exceptional skills in landing the aircraft so smoothly in bad weather and strong winds, so much so that the passengers did not notice anything different. Well done all round REX! Luckly it wasn’t the left hand prop otherwise it may be a differnt story ..
REX is such a professional outfit. Congratulations to the flight crew on calmly handling what could have been a disastrous incident. But where is the propeller? Good outcome for a major incident. I wonder if upwards and outwards would be the normal direction in which a propeller would depart such a plane if it sheared off rapidly, or was that simply good fortune. I am never enthusiastic when sitting right next to the propeller disk (Dash 8 for example) or turbines of an airliner (rear seats in Boeing 717 for example). I realise the risk of such an incident is very low! Great job by the flight crew, could easily have been a disaster. Lucky it wasn’t too far out from Sydney as it could have easily been a very different story. Great job by the crew to get the aircraft down safely.